Costa Concordia Cruise Ship Floats Again, After 2 Years : The Two-Way Salvage workers plan to move the Costa Condordia from the spot of its deadly wreck off the Italian coast this week. The ship will eventually be used for scrap. 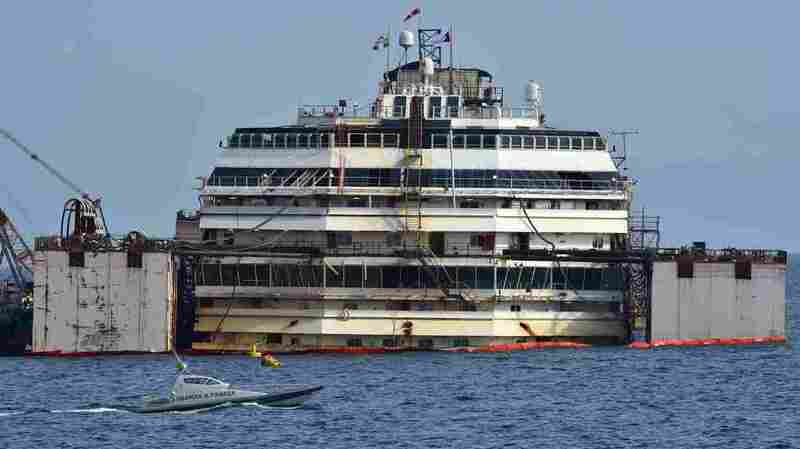 The process of refloating the Costa Concordia cruise ship started off Italy's Giglio Island on Tuesday. The initial moments of the refloating were seen as the most dangerous, as it wasn't known if the hull could maintain its integrity. Today marks another step in the largest maritime salvage operation in history. The current phase of the operation is expected to take about one week. Eventually, officials plan to tow the massive ship to Genoa, more than 100 miles away, to be used for scrap. The total salvage operation will reportedly cost more than $2 billion. You'll recall that back in January of 2012, the cruise ship calamity killed 32 people when it wrecked near the island of Giglio, off of Tuscany. One person remains missing, and the ship's captain faces manslaughter and other charges. More than 4,000 people were on board the ship when it struck a rocky outcropping. The wreck occurred in one of Europe's largest marine sanctuaries. As CNN reports, since 2012, "24 metric tonnes of debris, including furniture, dishes, food, personal effects and ship parts, have been recovered from the seabed." The Concordia was righted last September, in an operation that took 19 hours.